With over 20 different buildings dedicated to residential living, Housing operations that reduce energy and water consumption, and reduce waste, are essential to minimize the impacts of nearly 12,000 students living on the residential Hill. Click here for tips on living green! Click here to learn more about student leadership in sustainability! Click here to learn more about sorting waste! Click here for the Hazardous Waste Guide! Click here for Sustainability FAQs! – Helping to create a reusable dishware program that eliminated the use of disposable utensils at events involving food at residence halls. The Hill boasts nine LEED certified building complexes: 7 have a Gold rating, while 2 obtained the highest rating of Platinum. University Apartments off-campus housing has five LEED certified housing complexes. In February 2016, more than 119,011 kilowatt-hours of electricity were saved and over 2,500 residents pledged to reduce their buildings’ electricity use in the annual Do It in the Dark energy conservation competition within the residence halls. Dykstra, Rieber, Sproul, Hedrick, Cove, Landing, Holly, and Gardenia all have solar water heating systems on their roof tops to reduce the amount of energy needed to heat water. Increasing building density and the number of LEED certified buildings helps reduce our environmental impacts. Learn more. 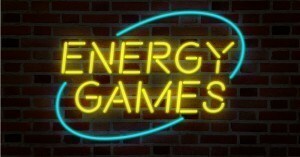 Each year, residents participate in a building-on-building energy competition and pledge to reduce their energy use. In 2014, over 2,500 residents pledged to reduce 119,000 kilowatt-hours of electricity. Find out how you can participate in the coming year! Nearly all residential high-rise buildings have solar-assisted domestic hot water heating panels to reduce the amount of natural gas needed to heat hot water. Combined, the high-rise systems are able to heat and store more than 15,000 gallons of solar-heated water. Lighting throughout the Hill and Guest House is undergoing a retrofit to LED bulbs. Based on current installations, more than 6,000 light bulbs have been replaced, saving an estimated 1.4 million kWh of electricity annually—enough to power nearly 150 homes for a year (EPA Equivalencies Calculator). In addition old heating, ventilation, and air conditioning (HVAC) units are being replaced by more efficient, new units. 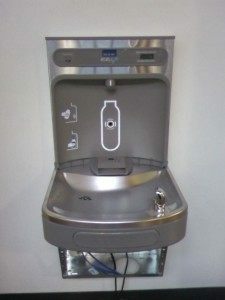 Drinking fountains are being retrofitted with water bottle filling stations to promote the use of reusable water bottles and reduce waste. Refilling water bottles instead of drinking from plastic bottled water saves energy, water, and money. It reduces the amount of plastic produced and polluted. Showers and faucets continue to be retrofitted with low flow shower heads and aerators. Ultra-low flow fixtures continue to be piloted across the Hill. On-Campus Housing Maintenance has installed a centralized irrigation control system that adjusted watering schedules based on weather data and landscape type to prevent overwatering. Currently 24 smart controllers are installed with the ability to add more. More than 30% of the irrigation system on the Hill has been replaced with high-efficiency drip irrigation systems. Drip irrigation works by emitting water to a targeted area, allowing water to sink below the surface to plant root systems. This is in contract to typical sprinklers, which result in water loss through evaporation. 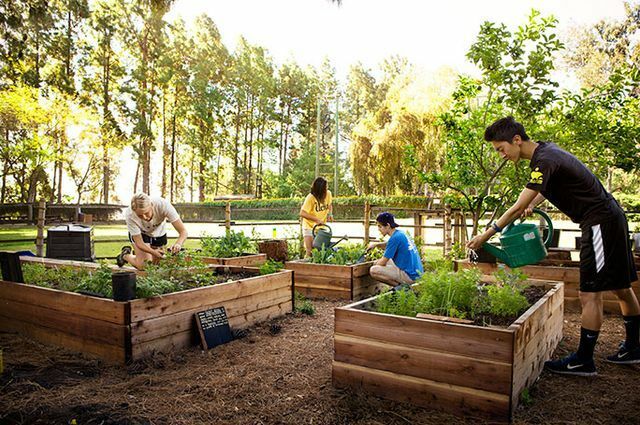 The drip systems are complemented by a 4–6″ layer of mulch to retain soil moisture and prevent seedlings from sprouting. Each year, the Office of Residential Life sponsors a clothing and goods drive during finals week in June to help students lighten their loads when moving out. 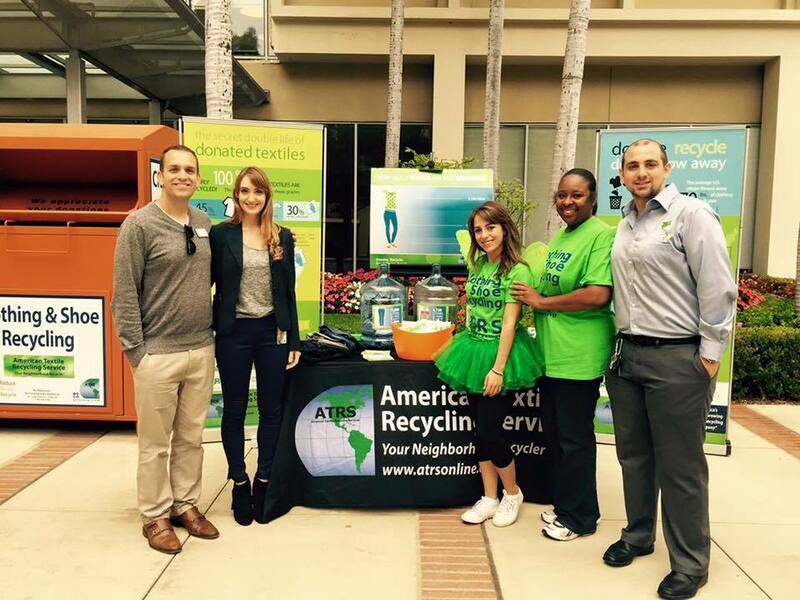 Southern California-based charities benefit from the donations while Housing & Hospitality Services diverts waste from the landfill.